Carl Kolchak, whether he wants the mantle or not, is the world's premier supernatural investigator. Vampires, werewolves, witches, demons�he has seen it all. Or, has he? 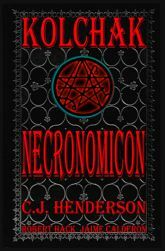 Can all the horrors he has stumbled across prepare him for the monstrous denizens of the Lovecraft Mythos, let alone Its' most damned: the Necronomicon? 188 Pages. Color. 7" x 10"